"Pop this little pocket book straight into your handbag"
I made this book for my sister-in-law who will be having a birthday here shortly. I wanted the decor to be simple because I also featured it on my blog for my Tuesday's Teacher...I like to make simple forms of the projects so people that are beginners can feel that they can make the projects too...and not feel that they need to have a gazzillion tools in order to get started! This is a simple fold album that you can make from one sheet of designer paper and one sheet of cardstock, a few embellishments and you're done...I mean really in today's busy life we just want projects that can be made fast and easy...and with gas prices thrifty is always a plus! One tool that I absolutely LOVE that made this project super easy was my beloved scor-pal...I really don't see myself making any score without it! One of the things that I did learn from making this album is that you need to make sure you have a really sticky adhesive, I prefer the ATG700 and regular adhesive that goes with it...super stick! Also, when making the pockets make sure you punch the holes before you adhere the pretty paper, LOL! I know my sister-in-law will love it, and thank you for this awesome contest! 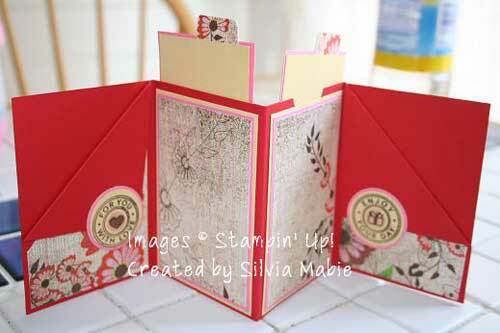 Thanks Silvia for sharing your mini book - I love the colors and the simplicity. 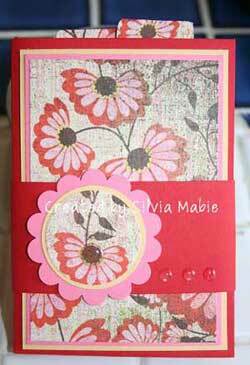 We have a similar tutorial to make a tag book.